The Salad Bowl Set has been designed for convenience. It holds up to 4 cups of salad. The Salad Bowl Set has been designed for convenience. It holds up to 4 cups of salad. The fork slides into the lid for convenient storage. It has a removable tray with three compartments. The removable dressing container nests in the tray and holds up to 4 tablespoons of dressing. 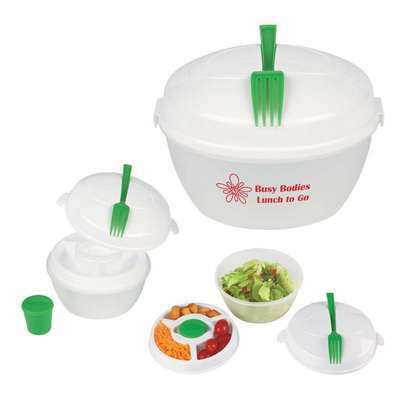 It is available frosted with white lid/tray and green fork/dressing cup colors. Use standard pad-print colors to imprint your brand name and give it away at trade shows, large grocery stores, and shopping malls.